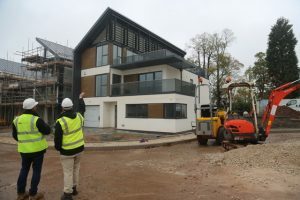 SIG Design and Technology specified Armourplan PSG fleece backed membrane as the single ply weatherproofing system for a development of 25 luxury homes being built on the former garden site of St John’s School of Mission in Bramcote village, Nottingham. Baxter Green, being developed by Willmark Homes, comprises a mix of three, four and five-bed family properties positioned around a ‘village green’ and has been sensitively designed to enhance the setting of a Grade-II listed building and conservation area that are also within the nine-acre site. 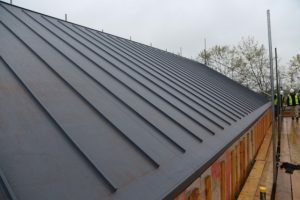 The properties’ roofs feature UV stable Armourplan PSG with hot air-welded standing seam profiles adding to the lustrous metal-type appearance. Phase one of the development features five five-bed houses and one four-bed home, all with ‘cold’ system distinctive single pitch roofs whose simulated zinc metal appearance complements the contemporary design. Armourplan PSG, which is adhered using Spectrabond low foaming PU adhesive, is made by IKO Polymeric in Derbyshire, the only manufacturer of PVC single ply membranes in Great Britain. The same high quality PVC compound is used on both the upper and lower side of the membrane, ensuring optimal weld strength and quality. 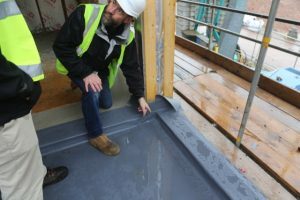 IKO’s Laminated PVC Coated Metal, a galvanised steel, was used to form bespoke trim detailing on the main high level roof, the drip edges matching the membrane’s slate grey colouring. Installed by J W K Roofing Services, the glass tissue reinforced polyester fleece backed PVC membrane is 1.2mm thick and is available in two-metre wide strips, which are hot welded together to form consistent, reliable joints. Armourplan PSG was also specified for the top floor roof terraces and first floor L-shaped verandas on the three-storey buildings. Approximately 180 sqm of Armourplan PSG was required for each plot. The second form of mechanical restraint, peel stop termination bars, was used on the roof terraces. Armourplan, which is recognised as a suitable aesthetic fit for conservation projects, carries a 20 year guarantee. Baxter Green is due for completion in 2019. Kevin Whitham, Director of J K W Roofing Services, said: “We find Armourplan PSG ideal for adhering straight onto plywood, with the fleece backing helping smooth away any bumps or unevenness in the roof. “It also adheres really well with the low foaming adhesive. We probably use it more than any other membrane.